A bat with a taste for midges has increased in numbers in Scotland, according to a new report. Common pipistrelles have increased by about 79% since 2009, following years of decline. 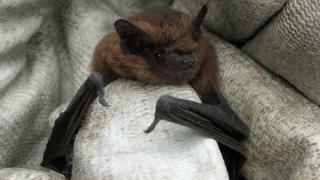 A single pipistrelle can feed on up to 3,000 midges in one night, according to Scottish Natural Heritage (SNH). Legal protection for bats, the loss of fewer roosts to development and less harmful timber treatment chemicals may have helped to boost the bats' numbers. SNH commissioned the report by the Bat Conservation Trust using data from the National Bat Monitoring Programme, which involves survey work by volunteers. Robert Raynor, SNH's mammal expert, said: "Although this is certainly good news, many threats still exist for bats. "There are nine or 10 species of bat in Scotland, and we still need to improve our survey coverage so we can better understand what is happening with their numbers." Anne Youngman, Bat Conservation Trust Scottish officer, added: "It's difficult to say why common pipistrelle appear to be recovering from the large historical decline. "It's really important that we encourage even more volunteers to help us continue and expand our monitoring efforts so that we can see how bats are faring over the coming years."